When it happens don't panic as we have the expert advice made easy so you'll be back on the road in no time - just follow these eight simple steps to dealing with a puncture. Remove the wheel and examine the tyre to see what might have caused the damage. If you do find something, remove it and mark the tyre with the small crayon or chalk that comes with your repair kit. 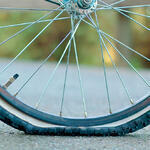 If you don’t find any obvious cause for the puncture, just continue with the steps. If you're not sure how to remove the wheel, see our post on how to do this here. Ease a tyre lever between the tyre and the wheel rim, then press it down against the edge of the rim, taking care not to puncture the inner tube. This should lift the inner edge of the tyre out of the wheel well. Hook the other end of the lever around a spoke. Do the same with a second tyre lever about an eighth of the way around the rim but, instead of securing it to a spoke, slide it along the rim away from the first lever. This should bring the edge of the tyre all the way off. Now you can completely remove the whole tyre from the rim. Remove the inner tube from inside the tyre but leave the valve in the wheel. 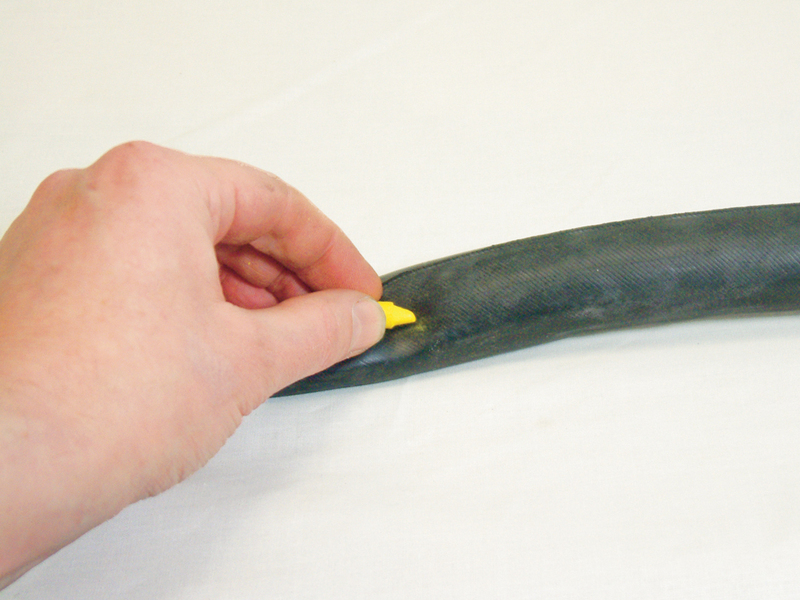 If you found a potential cause for the puncture and marked the location with a crayon, you will now be able to check the inside of the tyre for anything sticking through and look at the inner tube to see if there is a puncture at that point. Whether you found a hole or not, partially inflate the tube and hold it close to your ear and slide it through your hands, listening for a hiss. If you hear something but can’t identify the exact spot when you move it away from your ear, dab some water or spit on the tube in the approximate area and watch for bubbles. Alternatively, feed the tube under water in a bucket. When you have located the puncture, mark the spot with your crayon. 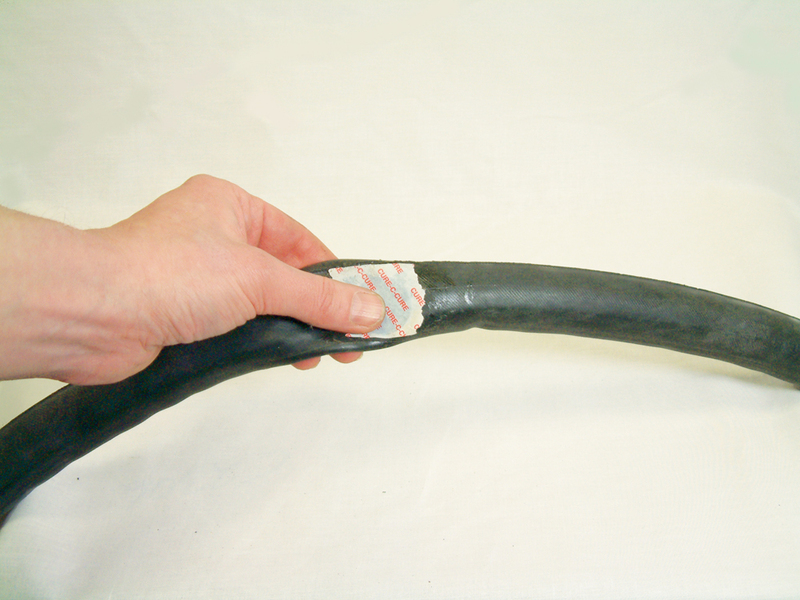 Dry the inner tube and roughen the area around the hole with sandpaper, then spread glue around the puncture covering an area a little larger than the size of the patch you are going to use. Leave the glue a few moments to become tacky. 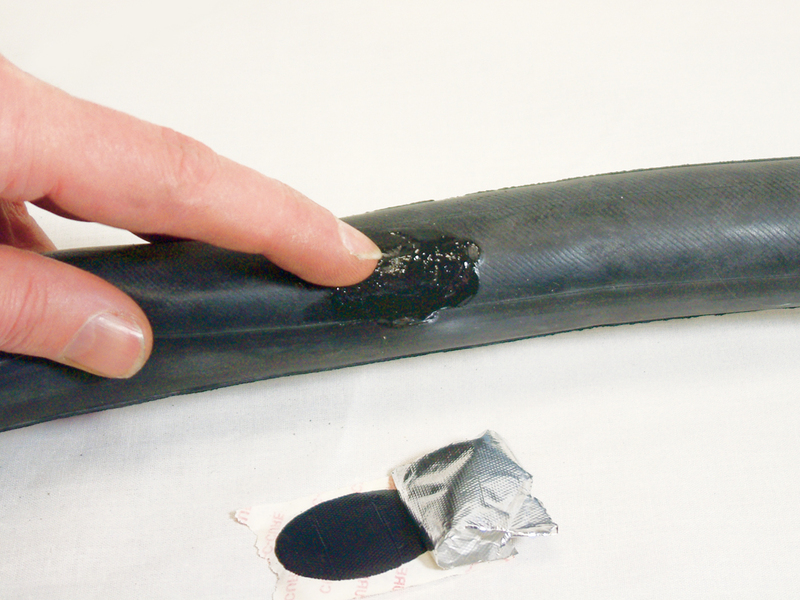 Place the patch over the puncture, pressing it down firmly, before peeling off the plastic cover. Dust the area with grated chalk and wait five minutes to make sure the glue is properly dry, then replace the inner tube and tyre. To replace the tyre on the wheel rim work the edge of the tyre over the rim with your hands, taking care not to pinch the inner tube at any point. Towards the end the tyre will become tightly stretched and you may need to use tyre levers to prise the last part over the rim. You can now inflate the inner tube fully.